An evening of electronic music by three Seattle-based artists. Stella Haze (Cristin Miller) is a writer and musician based in Seattle. Her work emerges from involvement with the improvised and experimental music communities, along with formal training in classical piano, voice and composition. Over the last decade she has performed with a variety of artists in various collaborations including Murderous Copulation of Birds, Seattle Improviser’s Orchestra, and Emma Zunz. Tonight she’ll play two new compositions for voice and electronics. One uses a jazz piece by her late father, composer Kenneth Miller, as a departure point. The piece was originally written as part of a suite to be performed by the LA philharmonic in the 60s. The second composition is inspired by a short story by Rick Bass, The Lives of Rocks. Pulling Out the Light is sound artist Briana Jones. 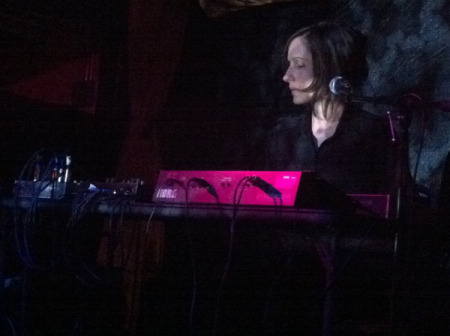 She uses analog modular synth, sequencers and a looper to create dark ambient soundscapes. Watch videos here, here and here. Raica is Chloe Harris, electronic musician and co-founder of the Further Records label. You can read an informative article about her here.